There really is no upper limit to fasting regimens. Once again, I will add a cautionary note. If you are taking medications or especially if you have diabetes, you need to discuss this with your physician before starting. The blood sugars often come down with fasting regimens, but if you are taking medications, it may come down too low. This is a potentially fatal condition called hypoglycaemia. It often manifests as shaking, sweating and sometimes seizures. Medications often need to be adjusted including blood sugar and blood pressure medications. Also, if you feel unwell at any point during the fasting, you must stop. You may feel hungry, but you should not feel faint, or unwell or nauseated. This is not normal and you should not attempt to ‘push through’. I am not specifically recommending any fasting regimens, only trying to document various fasting regimens in widespread use. The world record for fasting is 382 days. This was a 27 year old man in Scotland who fasted in order to lose weight. He weight 456 pounds at the start of the fasting period. During this time, he only took a multi-vitamin, and something called ‘Paladac’ which was vitamin C and yeast. Why on earth anybody decided that eating yeast was that important is really quite beyond me, but hey, this was 1973, when pet rocks and disco was popular, too, so there you go. He was able to drink as much non-caloric fluids as he wanted. After all, you would only survive less than 3 days without fluids because of significant dehydration. At various periods, he did receive some potassium and sodium supplements, and he was monitored by a physician throughout the fasting period to see if there was any deleterious effects on his health. Constipation is one of the main problems we see in fasting. The reason seems simple enough. There is very little going into the gut, so little comes out the other end. This is a problem we face routinely in our IDM clinic. With this world record fast, this patient had bowel movements roughly every 37-48 days. What’s important to note is that this is a normal phenomenon and not an abnormal one. You do not need to have a daily bowel movement to feel well. Nevertheless, less than once a month seems kind of extreme. His weight decreased from 456 to 180 pounds. Even 5 years afterward, he remained at 196 pounds. 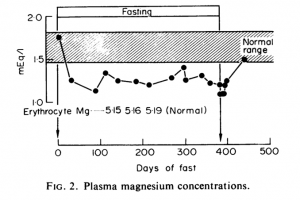 One of the most persistent concerns about fasting is the effect on electrolytes. You can see from the accompanying graph that blood sugars do go lower, but remain at the lower limit of normal. There were no episodes of hypoglycaemia. This is, of course, to be expected, since the body will begin the process of gluconeogenesis (making of new glucose) in order to supply the brain and certain other parts that need glucose (renal medulla and red blood cells). Even the brain is mostly using ketones at this point. As previously shown, muscle is not consumed to provide glucose (gluconeogenesis). Instead, the glycerol backbone from triglycerides (fat) is recycled into glucose while the three fatty acid chains are used for fuel by most of the body. Calcium and phosphorus levels in the blood vary over the fasting duration but generally remain within the normal limits and are virtually unchanged by the end of the fast. The same goes for plasma urea and creatinine, which are widely used measures of kidney function. Sodium, potassium, chloride and bicarbonate were all unchanged and in the normal range. In this study, uric acid remains stable although other studies have shown some increased uric acid. Serum magnesium levels did decrease in this study. This is consistent with what we see clinically in our clinic as well. It seems to be especially prevalent in diabetics. It is important to realize that 99% of the body’s magnesium is intracellular and not measured by blood levels. In this study, researchers took the next step to measure the magnesium content within the cells and the erythrocyte Mg levels remained firmly in the normal range. Nevertheless, we often supplement with magnesium to be on the safe side. The rate of weight loss was 0.72 pounds per day averaged over the entire 382 days. Other studies of fasting over 200 days had shown similar rates of weight loss (from 0.41 to 0.67 pounds per day) for periods of 210, 236, 249 and 256 days. This average of 0.565 ((0.41 + 0.72)/2) is actually quite interesting. We assume that one pound of fat is 3500 calories. This is a widely quoted figure, but not especially accurate. If we assume that one eats 2000 calories per day, then we would expect 2000/3500 = 0.57 pounds weight loss per day, which is fairly close to that number actually seen. So, for a patient with 100 pounds of fat to lose, you might expect that it would take roughly 200 days to lose it all. 200 days! I don’t generally subscribe to calorie theory for the reason the Caloric Reduction results in reduced Caloric Expenditure. In other words, decreasing Calories In decreases Calories Out resulting in a plateau of weight loss efforts. However, in the case of straight-on fasting, the caloric theory holds as promised, resulting in a weight loss very close to that predicted if Caloric Expenditure stays stable. 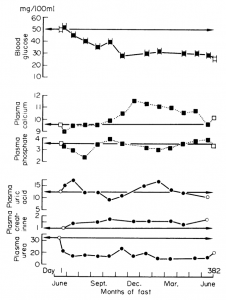 In other words – metabolism does not decrease in fasting. A prolonged caloric reduction, on the other hand, is shown to decrease metabolism. I’ve sometimes called Intermittent Fasting the ‘Ancient Secret’ of weight loss. Why do I resort to such Dr. Oz-like hyperbole? Well, because it’s true. It is an ancient technique of weight loss – dating at to the time of the ancient Greeks over 2. So, if you want to talk about time-tested practices, nothing beats fasting. Consider that LowCarb diets such as endorsed by William Banting also have a long history but only dating from the mid 1800’s. Obesity was quite rare in the time of Jesus Christ, so fasting was used as a method of preserving good health and improving mental clarity. But why is fasting a ‘secret’? Well, because the nutritional authorities have spent the last 30 years convincing us that we need to eat more to lose weight. We’ve all heard these lies. You must always eat breakfast within one minute of getting out of bed. You must eat snacks constantly, all day long or else you’ll be consumed by hunger and stuff your face with Krispy Kreme donuts. You should eat 6-7 meals a day or else you’ll be consumed by hunger and stuff your face with Krispy Kreme donuts. You should eat a bedtime snack or else you’ll be hungry while asleep and then stuff your face with Krispy Kreme donuts when you wake up. You must never, ever miss a meal, otherwise you’ll be consumed by hunger and stuff your face with Krispy Kreme donut. If you miss a single meal, you’ll develop eating disorders like anorexia. This last one must be one of the most idiotic myths out there. Fasting is not, like, exactly fun. It’s a hell of a long way from morbid obesity to anorexia. Furthermore, anorexia is a psychologic disorder of body image. Fasting does not lead to anorexia any more than washing your hands leads to obsessive compulsive disorder. But these lies persist. Nevertheless, because of all the worries, you can rest assured that there are studies that show that intermittent fasting does not lead to eating disorders. Sadly, the public at large has bought into these lies. You can see that from 1977, the vast majority of people ate 3 times a day. 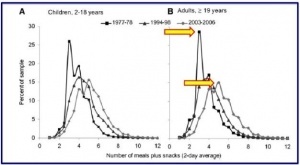 By 2003, most people were eating 5-6 times per day. This weight loss advice was as useful as a third nostril. Much of this increase in eating opportunity is likely to have been funded by Big Food. They want to sell more food. It’s easier to sell more food if people are eating more frequently. So, in order to do that, they needed to make sure that you didn’t ever miss a single meal. Can you fast? Yes – literally millions of people around the world for thousands of years have done it. Is it unhealthy? No. In fact, it has enormous health benefits, that we have not even touched upon yet. Will you lose weight? Here is the crazy thing. People have been convinced that fasting will make them gain weight (the bogeyman – starvation mode). OK, Einstein – if you don’t eat anything for 2 weeks, do you think you will lose weight? Of course. Is it difficult? Not really. Millions of people do it. But it’s not exactly fun, either. So fasting is effective, simple (one main rule – don’t eat), flexible (lots of different regimens), practical (saves time and money), and virtually guaranteed to work. So why don’t people support it? Because nobody makes money off you when you fast. Only when you buy crazy things like meal replacement shakes. Nobody wants to you to find out the Ancient Secret of Weight Loss. Will a daily 24 hour fast slow the metabolism? Its much easier for me to do a daily 24 hour fast than only few days in a week. But I definitely do not want to slow my metabolism. However, I’m still unable to fast beyond 24 hrs and I start to get headaches or tiredness or dizziness after 22-23 hours. And hence I begin eating again. I’m not on any kind of medication. No it wont. On the contrary it will increase your metabolism due to a hormone called Noradrenaline. THANK YOU, THANK YOU, THANK YOU for this post!!!! I have had so much grief slung at me from so many people over the years about how “unhealthy” fasting is, and worries over starvation and food disorders like anorexia. Your series on fasting has been so encouraging, confirming what I have come to believe about how healthful fasting has been for me. 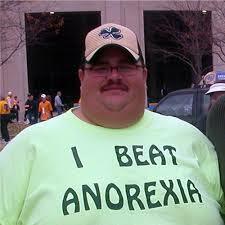 Yes, it does look like you are proof against anorexia. The fear of anorexia from fasting is disable for people with a fat accumulation problem. I just left a 96+ hour fast, I’m sure the desire to eat was mainly psychological vice physiological. In a subsequent article Dr. Fung shows that keytones appear after 2 days, so fasting is a fast way to ketosis. I eat strictly fresh, unprocessed, uncured meat and eggs, and I do 6:18 IF daily. Once a week I do 1:23. I’ve been eating nothing but meat for 10 straight months. It cured my sugar addiction. Anything that is not meat doesn’t even look like “food” to me anymore and has absolutely no appeal. Best way of eating ever! And I didn’t adopt this way of eating or the IF for weight loss. 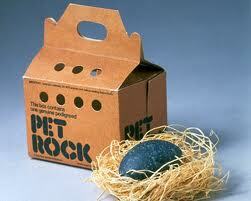 Deb & Valerie are correct – you can even find this in Taubes. Just get over it guys, correct the small error, and move on. It’s not a huge deal. It’s hardly the worst of Fung’s science flubs. 😀 Best wishes to all. Indicates the amount of protein lost is not great until body fat stores become depleted. I searched through the book on my Kindle, but there are many references to “protein”. I couldn’t immediately find an amount of protein lost. By the way, starvation mode in fasting does not occur for a very long time (according to Vlad’s book anyway), when fat stores are basically depleted. As for this, “Do you have any data showing that energy expenditure is less affected by prolonged fasting than with slower weight loss?”, Dr. Fung has posts related to this. surely you have come across STARVATION IN MAN, from Cahill, numerous times through your readings. Dr. Jason Fung: Again, Valerie, your hostile tone is not appropriate for this forum. I provide this information in my own time, free of charge, yet you insist on belittling and insulting me. I have removed the parts of your post that are inappropriate. > 50 grams of protein per day is really nothing. 50 grams = 0.11 lbs. So 30 days a month * 4 months of fasting = 13 lbs of muscle mass lost? That’s far from nothing! I just did a 4 month daily intermittent fast, and lost 30 lbs of weight. I sure hope 13 lbs of that were not lean muscle mass (I don’t think so, but who knows?). Dr Fung has already mentioned that one of the main reasons for fasting is Autophagy. Which is a prioritized breakdown of damaged cells allowing unneeded proteins to be broken down and the amino acids salvaged for the synthesis of new protein. The failure of autophagy is thought to be one of the main reasons for the accumulation of cell damage and aging. I don’t know how they measure the protein loss but I guess that this recycling process does not recoup 100% of the damaged cells it breaks down. Can you tell me what form/type/brand of magnesium your patients take. Dr Fung, thank you for all you share with us, you are the first person to actually explain the reason for the obesity etc. and how to correct the problem where it began – high insulin levels. Love your witty and informative posts, delivered with humor along with explanations I can understand and principles I can easily follow. Victoria, your story above was excellent, glad you spoke out, funny how anyone that challenges the main stream is quickly shut down and the ‘ expert ‘ moves on.. quickly. Dr. Fung did you say before that eating low calorie over fasting will make you more hungry and slow metabolism? Why would eating very low calorie in a day make you more hungry than not eating anything at all for a period of time? When I try to eat a LC diet I tend to limit my food intake naturally because I hate meat unless it’s processed and I get very hungry all the time to the point where I cry because the hunger won’t stop no matter how much or little I eat. Hi Wendy, I know its weird. But not eating anything at all is much easier than eating a little bit of food. For some reason, eating a little bit of food makes you hungrier than not eating anything at all. I suspect its because of the insulin which is needed to digest the little bit of food that you ate. I was amazed when I tried the 24 hour fast and found it much easier to do than eating little bits of food every now and then. Right on, Sarah. I call it the Lay’ s effect:you can’t eat just one. Once I start, that’s it. Since I went high protein, fasting is even easier. Also wanted to add nutritional yeast flakes are quite nice 🙂 Chocful of B vitamins and high in protein they have a savoury/parmesan cheese type flavour so I sprinkle them over meat dishes, stir frys, veggies, salads. Did you write about orcas you comment on ketone salts and ketone esters to increase blood ketones and reduce BOTH blood glucose and insulin? Fasting 36 to 40 hours and then a 24 hour fast along with low carb keeps my BS in the 60 to 80 mg/dl range BUT what I have read about ketone salts and esters is of interest and may help those trying to smoothly enter and maintain the benefits of nutritional ketosis and intermittent fasting. Hi Marie, the other thing you could do is try to add fermented foods to your diet. I’ve added some yoghurt periodically and also sauerkraut. However, I’ve been on low carb many times and never experienced what you experienced. Cutting down on sugar and carbs is good, however you achieve this. I too have had stomach problems and headaches during the initial days of low carb diet. And also after my cheating days. Yes, the diarrhea is severe and so are the headaches, they are mostly migraine-like with visual disturbances and nausea. But it usually lasts only 3-4 days. After I’m settled into LCHF, it gets better. I make sure to eat 2-3 spoons of homemade yoghurt as well as a drink of apple cider vinegar with warm water, a pinch or turmeric and a pinch of pepper daily to ease my headaches and digestive problems. I mix 1 tbsp of apple cider vinegar with a cup of slightly warm water. And I also add to it a pinch of turmeric powder and black pepper powder and sometimes a little salt esp if I am beginning to have the headaches. Sorry for not being specific. I use turmeric in the powdered form and by pepper I mean powdered black pepper. I use about 1/8 of a tsp for both. I use the turmeric (which contains curcumin) in combination with the black pepper for reducing any kind of inflammation in the body. The body is able to effectively use the curcumin in the turmeric only if there is black pepper too. The apple cider vinegar, however has probiotics esp if it is with the mother of vinegar and this is what helps the gut. Have you checked your omega3 and 6 balance? A high omega 6 ratio leads to high inflammation risk in the body (if you consume alot of sunflower oil, peanuts etc). Oh, Wow! …no, my doctors haven’t checked my omega3 and 6 balance. I do eat peanuts (I wouldn’t say a lot, but I do eat them). A doctor did tell me to go on Omega 3, but that was to lower my cholesterol. And I have been taking Omega 3.6.9 (Flaxseed, Borage and fish oil blend) to try to help my diabetic neuropathy. Golly, I had no idea that an imbalance could lead to inflammation. I will have to look into this further. Thanks for sharing. For me, apple cider vinegar initially caused diarrhea. It has prebiotics (which is the stuff that feeds the probiotics, which are the bacteria in your digestive system). I would go slowly with it. When I started intermittent fasting, I stopped apple cider vinegar, as I was afraid to take it on an empty stomach. I’m now restarting taking it, but I’m going to start slow. There was one more thing I wanted to mention. I had read somewhere that when you take Apple Cider Vinegar on a regular basis, you should always rinse your mouth out with water after you take it. Apparently Apple Cider Vinegar can corrode the enamel on your teeth. That’s absolutely true. Acid is bad for teeth. That’s why I’m thinking of taking my vinegar all at once instead of drinking in water. Anyway, let us know how it goes. I’ve just started taking apple cider vinegar again. I’ve adding a little to water, although I think I’m going to take a “shot” of it to reduce the chance I get much on my teeth. I just thought of something. What about taking your warm water with Apple Cider Vinegar through a straw? I’m trying it right now. You will still get some on your teeth, so you would have to still rinse your mouth with water after you drink the Apple Cider Vinegar, but it might help to minimize any potential damage to your teeth. Thanks Marie… I’ve always had poor dental health. So I do oil-pulling with coconut oil and brush my teeth every morning after drinking ACV. In the nights, I just brush my teeth after drinking ACV. I just drink the ACV in about 4-5 big sips. Its a little too sour for me to drink in one go…. Dentists recommend waiting 30 minutes after eating or drinking acidic things before you brush your teeth (but DO rinse your teeth right after the acidic drink/meal). The reason is that the acid opens the pores in your teeth/bones and makes them softer and easiest to erode by brushing in those first 30 minutes. I’ve noticed I have less tooth sensitivity when I rinse my teeth with water and wait 30+ minutes before brushing. I didn’t know this. I’ve never had a dentist tell me this before, so thank you for sharing this with us. So, what you are saying is rinse your mouth with water immediately after taking the Apple Cider Vinegar. Then wait 1/2 hour before you brush your teeth. My sister has so many problems with teeth sensitivity. She had been taking Sensodyne (as recommended by her dentist). But she told me she believes that after years of use, the Sensodyne has affected her taste buds. …that seems like a high price to pay! Try reading Wheat Belly if you want to try to eliminate the joint inflammation and pain. The toxic substances in grains worsen arthritis etc. When I completely avoid anything made with grain/flours my hip,leg neck, shoulder,wrist ,hand and back pain disappear very quickly and return even quicker if I touch grain products. i started a fast immediately. with no preparation, went 44 hours on my first try (just water), and felt AWESOME. had a SINGLE meal (LCHF) and did a 42 hours fast. had a LCHF meal, and did a 2ish hour fast. in all, i ate 7 times in one full week, saturday evening to saturday evening. Dr. Fung…on day six of extended fast…planning on minimum 14 days but perhaps 30 ? Not a single issue…you rock ! Please can you explain again or direct me to your or others work on ‘resetting’ the bodies set weight ? I’ve been drinking tea with cream while fasting. So i may as well not have bothered right? I have done it wrong. That is good to know, I felt like I’d been wasting my time and was worried that it would be actually detrimental. Oh, after Instarted LCHF and IF, my tongue returns to normal, no longer have the tingling or numb feeling. Acne all cleared. Plantar fasciitis on left heel fully healed. Now left with trigger finger on right 3rd finger to go…I soak it in like warm water with Epsom salt every night, feeling better. Will continue to do so. In the post Dr. Fung states “metabolism does not decrease in fasting. A prolonged caloric reduction, on the other hand, is shown to decrease metabolism.” In parts six & seven, Dr. Fung speaks about 12, 16 and 24 hour fasts where people eat once or twice a day. My question: why is eating once a day (24 hour fast) considered “fasting” and not prolonged caloric reduction? I am concerned, as Sarah above, that eating once per day will slow my metabolism. You don not die after going 3 days without fluid unless you are in the middle of the desert. Dr. Sergei Filinov of Russia has written a fascinating book called Dry Medical Fasting and he regularly supervises dry fasts of up to 11 days in length. I did one on my own for 10 days. It was a profound experience. I certainly would never recommend any do a dry fast without first reading his book. But it is absolute possible and has many health benefits. I disagree with this comment. From personal experience I went through 5 days with no water or food (Dry Fasting) and felt fantastic! Plus I know of people who Dry Fasted for up to 11 days. Dr. Jason Fung: I stand corrected. However, I would absolutely NOT advise Dry Fasting. That, of course, is my own opinion. Sorry, it was a typo. I know your name is Dr Fung!!! We met last week; I watched all of your obesity videos! I was fine at church. I took 2 tiny pellets of pure licorice during the service but I think that was for my own paranoia than anything else. So I broke a 38hr fast on Sunday afternoon (a lot of food, HFLC 5 course meal over 4+ hours) with no more reported episodes and now it is Monday and I am now 14hrs fasted and settling in for the long haul with my limes and fizzy water. Peace out. LOL Read “lowest weight in my [ADULT] life”. LOL I know my mother had a difficult birth but I was tiny once. I fasted for 7 days Sunday – Sunday. I felt fine and had now problem at all. By Sunday morning I was full of energy and didn’t feel like I hadn’t eaten in days. I broke the fast on Sunday for lunch and wish I hadn’t eaten really. Numbers for 9.30am Sunday morning (6.5 days fasted). 4.5 and 4.2. Hmmm I here you say, they are great blood sugars/blood ketones. Actually it is 4.5 which is the blood ketones and the 4.2 is the fasting blood sugar!!!!!!!!!!!! Diabetes be gone!!!!!!!!!!!!! Being only 42hrs fasted currently, I can’t spell hear. Sorry about that. Give it a few more hours and I will be my usual sharp, no doubt. So I ate Sunday, fasted Monday. I felt slightly nauseous Monday morning and then terrible headache last night right at the front of the forehead. Kept up the fast and drinking salted liquid. Took 2 paracetamol and went to sleep. Awoke this morning feeling more like myself of late. I definitely feel better fasted. It makes me wonder about just fasting right through to skinny but I need to eat when I see family or they will (needlessly) worry. Tues morning: 18st 8lbs. Any comments on fasting during menstruation? Isn’t it supposed to be tough? And doesn’t it make us bloated and retain water so can’t lose weight? My goodness. I forget how much weight I’ve already lost!!!!!! I really need a few hours fasting time: actual weight Tues morning: 17st 8lbs! Oops. I have a family thing on Fri night so I am planning to not eat until then. I think it works if you plan like that. It gives a goal. 18st 5lbs today. Still like a stone over where I was on Friday. Crazy. Must surely be water weight. So I am drinking black coffee and am currently 36hrs fasted now. Surely it must go soon. This seems absurd. I was reading around the subject and it seems that water weight can dissipate after a meal sometimes and also that sometimes 2-3 day fasts instead of longer fasts are a good idea. Maybe I am short on phosphorous? I don’t know what to think… So I broke the 46hr fast with (keto) fried cabbage, sausage meat, liver and extra egg yolks. I added lo salt for Potassium and took kelp and magnesium supplements. Will try fasting again tomorrow and see how it goes. 18st 3lbs this morning, after last night’s meal. Just feel bloated and huge and slightly tingly now and again. I am not hungry so am listening to my body and drinking dandelion coffee and fizzy water with lime and lo salt (potassium source). I also took another magnesium malate. I heard malic acid is good for liver flushes but I don’t know whether a liver flush is just a load of nonsense. Anyway I don’t feel worse after eating a load of keto grease last night so I will carry on as if I wasn’t blown up like a balloon. Sounds like you doing fine. I’ve been diabetic for 2 years now and just getting a grip on it.. Keep going, your body will thank you later..
17st 7lbs this morning. I last ate on Sunday. Today is Tuesday. Not sure whether to eat a meal tonight or not. Can’t believe I am still not down to the weight I was 12 days ago. But I am pressing on. HI Danielle, for the headaches I drink some water with Himalayan salt and a sprinkle of lemon. Hope it helps. Cuts the appetite too for 1-2 hours (to push a little bit more). 16st 9lbs on 6th April. Waist down to 37 inches. Still doing back to back fasts seprated by 2 or 3 days. Feel fab. Blood ketones always btw 2 and 5. Fasting works for insulin resistant people like me. I have got my mother eating this way now. And crucially, no more headaches after that initial insulin drop after the edema. I am fat burning. Slightly frantic, loads of energy, jumping up and down. Weird. Well I am 16st 11lbs and never got down to 16st 9lbs again despite doing 2-4 day fasts. Not sure why or what is happening but I am sticking with the fasting. This morning ketones 4.1, blood sugar 4.4, currently 68hrs fasted. ketones last night (june 15th) only 1.4 but felt fine, no headache and no light headedness so I pressed on and fasted all day and night yesterday.